Are you in the market for new gutters and searching for a Hunterdon County Gutter Repair? So why are gutter guards important for your home? Gutter guards are those thin slats made of aluminum, stainless steel, mesh material or plastic that lie on top of the opening of gutters. They prevent sticks and leaves from getting stuck in the gutters and therefore, makes cleaning easier. They are attached into the nose of the gutter and partially inserted beneath the shingle of your roof. There are many different kinds and designs, but they must all have small openings to allow water into the gutter while keeping leaves, sticks and pine needles out from getting stuck. Most guards can be removed and reinstalled so that they can still be cleaned at least once a year. Some individuals that have purchased a home are unaware that the gutters have guards or screens already installed. Unfortunately, some gutter cleaning companies would choose to keep their customers unaware of guards, so that they can repeatedly clean their customers gutters even though it may bot be necessary. If you are questioning whether you have guards or not, go to any window in your home where a gutter is noticeable and you should be able to see it. It is critical that you mount the right type of guards on your gutters. Always depending on the type of trees that are surrounding your home. There are many types of guards for all size leaves. A great company always advises the proper guard for each customer specific home. Mounting guards can be beneficial because it can let you go without a cleaning from two to even five years. You won’t have to be concerned during Spring or Fall about finding a suitable time to get the gutters cleaned along with everyone else. In the long run guards are an investment for your home that will save you money every season. Gutters are the long aluminum pieces that run horizontally along the edge of the roof of your home. They are to collect rain water that comes off of your roof. Depending on which way the gutters are positioned, they lead the water towards the opening which is the hole that attaches the gutter to the downspout which runs vertically downward to the ground, keeping water away from your home. These gutters are very important because they channel rain away from the foundation walls of your home. As years go by, rain water collecting at the base of your home can eventually Years of rain water collecting at the base of your home can often lead to large breaks in the walls of your basement. That can cause damage to your home and ultimately affect your budget and become a big expense. Some drain directly into the ground, into underground gutters that dump the water out into the street. These drains do get clogged at times but can be snaked or cleared with pressure. The way you can tell when an underground drain is clogged is when rain water backs up or starts leaking where the drain connects. 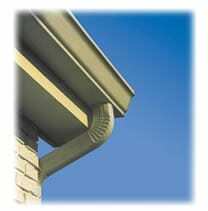 A good gutter company helps to protect your home from any damage from rain water. There are some safety tips for cleaning your gutters. When gutters are clean and empty they are able to function at their best even if there are on the roof or openings of an underground drain that goes to the street. Uncleaned and ignored gutters can disrupt the entire system and will put your home at risk. Gutters are manufactured seamlessly into your homes which can make them easy to overlook, but ignoring them for too long a time can lead to severe damage to your home and can be more expensive to repair. If you are searching for the best Hunterdon County Gutter Repair call NJ Replacement Windows.